So I’ve got a new haircut! It’s awesome! Just as race day preparation means putting the right tyres and tubes on your wheels it also means the right haircut. 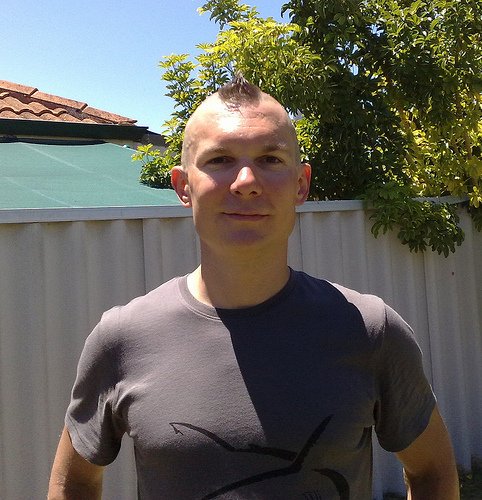 I’ve been meaning to try a mohawk for ages, but only just got the courage. The truth is it’s the best hairstyle I’ve ever had. Whether it’ll be of benefit on race day who can tell. It does mean being extra careful about suntan lotion on the head now. Then of course there’s the huge growth of hairs on my legs. I say huge, not because I’ve left them to grow for three or four weeks, but to appear more manly given the pitiful amount I have! In the spirit of trying out new things I got them waxed this time! It’s not as painful as some guys seem to make out. At least if you’re not a hairy monkey anyway! All over and done with quickly, the results seem good so I’m happy. Anyway I doubt many of you came here to hear about my pre-race beauty regime. Let’s talk race plans instead. I’m not going to go into too much detail now, I’ll assure you after the race they’ll be plenty. Hopefully looking back at a very positive performance. Swim The variability in my swim performance of late leaves me a little concerned here. I had a great swim here last year, probably due to a good draft. I hope to replicate that and get myself out the water in an hour. This morning’s short session down by the jetty was a morale boost as I felt I was going quite well. Even if I did manage to sight off the wrong yellow buoys at the start! Unlike some previous races I’ve taken some time out of the water. Not swimming every day, whether this wil have a positive effect I’m not sure. I do think the recent threshold and stroke rate work should be a big help. On Saturday the aim is an hour or below for the swim. That should set me up nicely for the day ahead. Bike I’ve put a lot of emphasis on riding this past month and feel I’ve been working harder. A few interval and time trial sessions out there on the course fill me with a reasonable amount of optimism too. I’m going pretty well and the lightness of training this week should leave me in good shape to ride strongly. Winds will ultimately determine the times of course and it is looking to be windy on race day. So with that in mind the aim is a 4:50 on the bike. That’s five minutes faster than I managed last year… I wonder if the disc cover can make that for me! I feel I’m a lot fitter than last year and my biking is stronger. I’m going to be racing with power too which makes a big difference for pacing long races. I’ll also be wearing some compression calf guards, mostly to save putting socks on in transition. Not having used compression on the bike before I have to say it felt quite pleasant on today’s test ride. Despite having time goals in mind I’ll admit I’d like a bit of wind out there. Recent experience suggests to me there are two factors that favour me – heat and wind. Both are forecast at the moment. I’d take a knock to my time if it improves my placing! Run Apart from the run I’m aiming for a quicker transition as I won’t have those damn compression socks to pull on! Out on the course I’ll stick to the strategy that’s worked in the last few races. Comfortable pace for the first 30km or so then push it. With three 14km laps I aim to push the whole of the last lap. It’s a challenge, but recent experience should give me the confidence to give it a go. As part of the strategy I’ll be taking on gels early and often in the run whilst the intensity is still low enough. So much of my race relies on the intensity staying at a level enabling me to consume food. I’m a little nervous of this aspect of the bike as potentially I’m pushing just a bit harder this time. The aim is to run a 3:05! A good five minute PB if I achieve it. The course is flat and I know I can run that fast. I don’t think it’ll be easy mind you. I’ve not run anywhere near as much as usual of late and really can’t say how my run is going. I’ve had some great moments in training, but can I bring them on race day? Ambitious goals that lead me to around the nine hour mark. Going under nine hours would be the dream, the perfect result. Whether conditions allow is another matter and I mean both the weather and the state of my body! Whatever time I might achieve the goal is to podium and grab a Kona slot early. What I’m laying out here would make that pretty likely. Anything can happen on race day though! That’s it all there on the line for you. Nobody can be in any doubt of my intentions. Race day will decide if I’m up to the challenge. Whatever the outcome I hope to have a solid race and push my performance from start to end. If that gets me where I want all the better. Should I fall short then I know I have work to do before New Zealand.